Today’s weather was threatening and the ride long, so I began riding about 7 am. Our days of flat riding are certainly over – today we climbed over 3,000 feet, which we had done only day (Osceola, WI to Red Wing, MN when we were climbing the bluffs above the Mississippi River) since leaving the Rockies in Western Montana. The overcast sky, occasion sprinkles, one rain shower, and terrain didn’t allow much photography so I only have two photos today. However, they do provide you a good picture of today’s ride. One more note – the road conditions in New York continue to be great for biking. Dinner in Pulaski, NY at the River House Restaurant in Pulaski was exceptional – highly recommended. Mile 32: Typical view of the roads and scenery we biked today showing the rolling hills and road conditions. 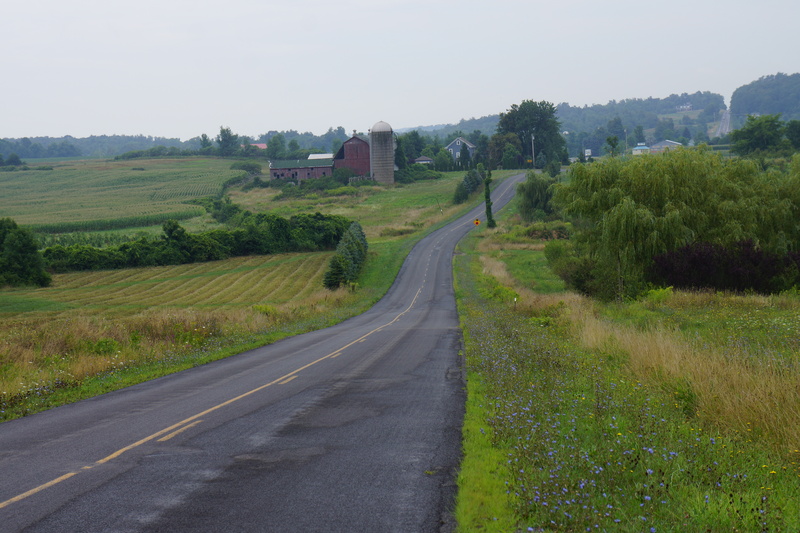 Mile 45: Another typical view of today bike ride showing the rolling hills (note upper right hand side of photo which shows how this road continues).